West Coast Weekender began life in 2016, and it’s a festival with a mission. While there are no shortage of dance music/EDM festivals in California, only West Coast Weekender has business and educational programs running alongside the partying, making the event the Golden State’s answer to the likes of Miami’s Winter Music Conference, Amsterdam Dance Event or Ibiza’s International Music Summit – all key destinations for dance music professionals, aspiring amateurs and straight-up music lovers alike. It is also California’s only dance music festival and conference to take place at a Four Diamond destination complete with a 24- hour casino. 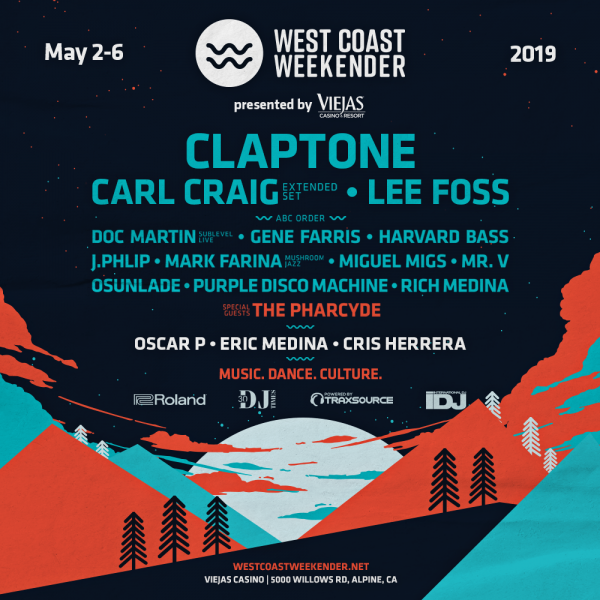 The line- up for this year’s Weekender includes Claptone, Carl Craig, Lee Foss, The Pharcyde, Purple Disco Machine, Doc Martin, Gene Farris, J.Phlip, Mark Farina, Miguel Migs, Osunlade, Rich Medina, Oscar P, Eric Medina and Cris Herrera. By day, the Weekender offers keynote Q&A’s, panels, workshops and technology showcases where experienced industry figures can stay abreast of the latest trends in the dance music business, while sharing their knowledge with younger attendees who are trying to break into the game. But when the sun goes down, it’s time to party – and of course, if you feel like starting early, there’s plenty of musical entertainment on offer during the daytime, too! In short, West Coast Weekender 2019 will bring you a multi-day underground music festival and conference experience, rooted in the culture, comfort, love, and hospitality to which we’ve come accustomed. Weekend tickets start at $139.99 and a limited number of VIP passes are available while supplies last. Rooms range from $149-$399 per night. Book early to avoid disappointment!